The magician has a female member of the audience come forward. She is told that he has a special gift for her. It is a necklace from the far away land of China! The magician then shows her the necklace of plastic beads. This gets a laugh from the audience. The magician explains that this is a "Magic" necklace which will now be demonstrated. From a flat piece of paper the magician rolls a cone. The lady holds the cone and the magician holds the necklace over the cone opening. The magician cuts the necklace and the beads fall off the cord into the cone. The magician cuts up the cord and throws it away. After saying some magic words and making magic signs the magician reaches into the cone and pulls out a completely restored necklace! 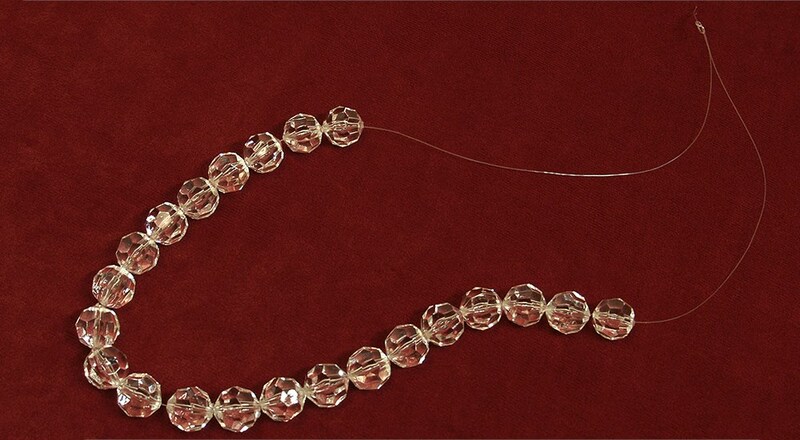 The necklace can be hung around the ladies neck and given out if desired. The cone is then shown empty on both sides and the magician gets well deserved applause! This trick is completely self working. Absolutely no sleight of hand is involved. Reset time, if you do not give the necklace out, is about 5 minutes. You can do this trick surrounded on all sides and there are no bad angles to worry about. Great for entertaining both kids and adults.